For a season, the Lord was calling me into my studio to paint with Him. Each time He did, it was like I was pregnant with this painting I had to release. 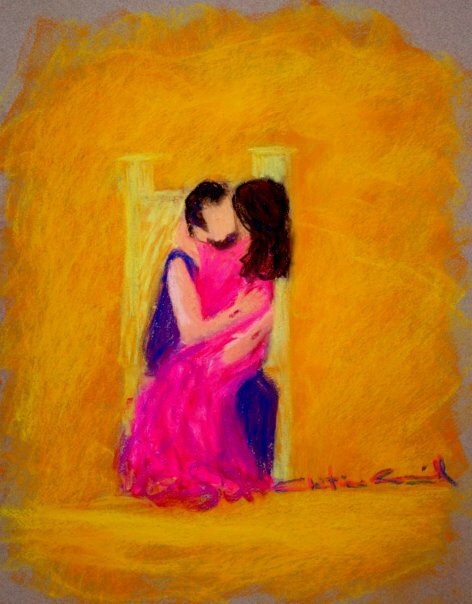 Sometimes I would see the vision beforehand and wait for Him to tell me when to paint it, other times I would just stand before the easel and His Spirit would come over me, then I would experience the vision, and sometimes as I drew it, more revelation would come. I tried to capture the testimonies of each sketch and I did not use reference photos, but created them completely by His spirit. I hope and pray they will take you deeper and closer to Him, and you will have the revelation that you are His Beloved Shulamite Bride. One day I was with the Lord worshiping Him, my hands were outstretched in front of me. I saw him take a large paint brush and begin painting my hands with it. I asked Him "What are you doing? 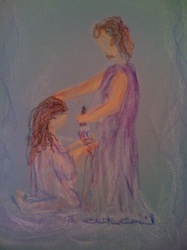 ", and He said, "I am painting your hands with Love and Grace for My purposes, in you". I held my hands up to my face, and asked Him if I could see the colors, He said "it doesn't matter, I have painted them with My Glory." As He was doing this, my hands got very warm and stayed that way all day long. 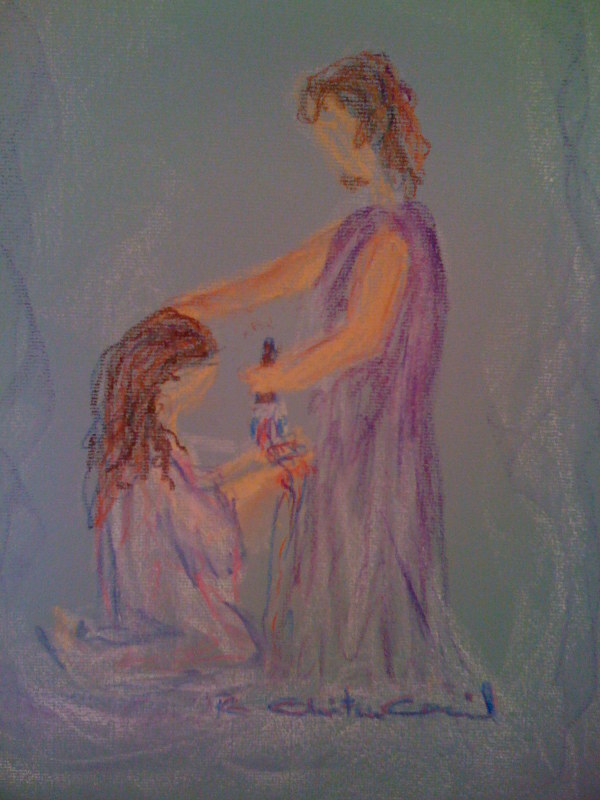 In front of my easel, I asked the Lord to show me something to paint, and to let it be for someone. I was heading to do my first prophetic portraits in a couple of days and wanted reassurance that I could do it. As I worshiped Him, I saw me dancing with Him, something we love to do especially to the song by Paul Wimber, "Dance with Me". When we finished, I posted the image on Facebook. A noticed a friend of mine was on chat and so I asked her to take a look at the new painting, and tell me if it meant anything to her. She came back saying, "THAT's for ME! That's for me! He has been telling me to come and dance with Him all day!" The Lord is faithful! I was going through something painful and went to be with the Lord. 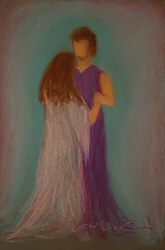 In my time with Him, I saw myself leaning on Him. 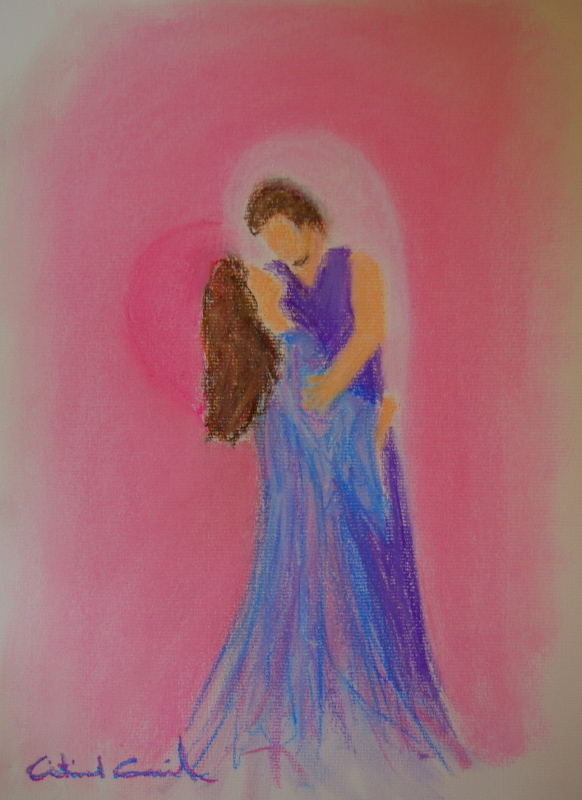 My head pressed into His chest, leaning fully into His heart. His arms were so strong, yet gentle. When I saw the wounds on His wrists, it ministered to me because it reminded me that He understood my pain, and had even bore it for me on the cross. I was in a church in Savannah GA, and I saw the Lord come into the church. I was on the front row beside one of my spiritual leaders at the time. My eyes were closed, but I "saw" Him going to people and ministering to them. I thought maybe I was making it up, so I stopped "looking." But after a little time, I thought, so what if I was making it up, it was a blessing seeing the Lord loving on people, besides, my imagination is sanctified. So I looked again, and by this time He was very close to the front. He came right up to me and looked into my eyes. He was speaking of His Love to me. I turned my head up to Him, and drank Him in, weeping in His presence. When He finished filling me with His Love, He turned and walked away from me, past the person on my left, then to my surprise, they yelled out, "Jesus just walked past me!". I was undone! A couple of weeks before, someone was praying for me and saw Jesus and I on a bench in a garden. We were embracing and we were looking into each other's eyes. 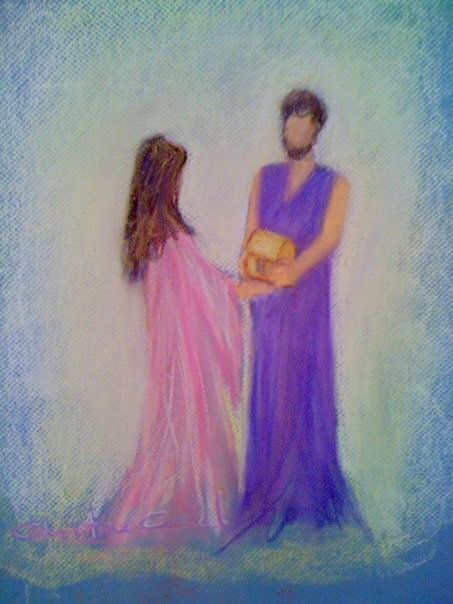 They heard, "True Love" and "Shulamite"
Both of these events inspired this new painting of Jesus with His Bride that I painted in my studio in the presence of the Lord. The heart appeared as I painted it, the white side of the heart represents the pure love and pink the passion. When I went to paint recently I remembered a vision I'd had the other day and it wouldn't leave my mind...so I painted it. After someone saw my painting, they said this is what the Lord is doing in the Body, so I hope it will minister to the Bride. Here is the vision: I saw a shovel, then I saw it digging and that Jesus was the One digging. I saw him wiping His brow, because He was working hard. He found a treasure chest and started carefully cleaning it, using running water and brushes to make it presentable. Then He handed it to me and started speaking "It's my Treasure. I give it to you, its my treasure for you, its my purpose(2x), for you. It's my lock box of Love for what I am calling you to do. It's everything you need to be what I am calling you to be. It's the hidden treasure inside of you that has been waiting for such a time as this. Don't be afraid to receive what I have for you. Don't be afraid to receive what I am giving you. Just receive it with joy and anticipation of what the future holds. Don't be afraid of the future. For I know the plans I have for you, they are good, plans to prosper you and not to harm you, to give you hope and a future. Don't be afraid. Don't fear. Take the treasure." So, I took the treasure, and pushed into my heart. I squeezed and pressed it and it went right inside my heart...and I felt something in the Spirit then I started crying. “This time of year, all the children line up to sit on Santa’s lap, and tell him what they want for Christmas, but I how long to have my Bride come to me and sit on my lap. 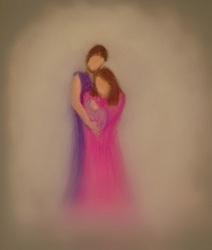 I want to hear her whisper in my ear what she wants…to share her hearts desire, to see her be a child on her Father’s lap, trusting Me to provide all her needs according to My riches in Heaven. 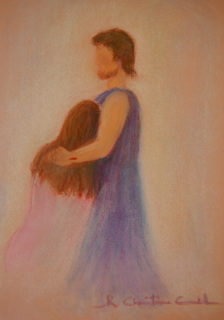 I am Jealous for Her.” Tonight, Christmas Eve, I remembered what He showed me, and I was ready to paint it. As I was painting, I saw a big throne that He was sitting on, and as I started it, that worship song, “I see the Lord, seated on the throne…” came on my iTunes, "randomly". 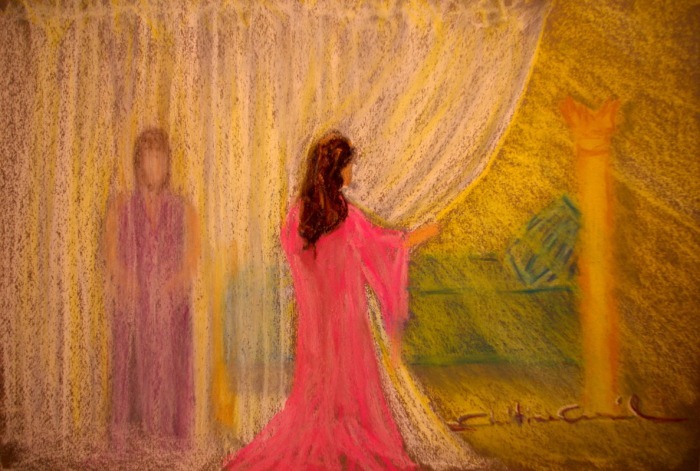 Then as I heard the words, "and the train of His robe filled the temple with Glory," I saw the Glory all around them, and it came into the room where I was...and so I put it in the background of the painting. 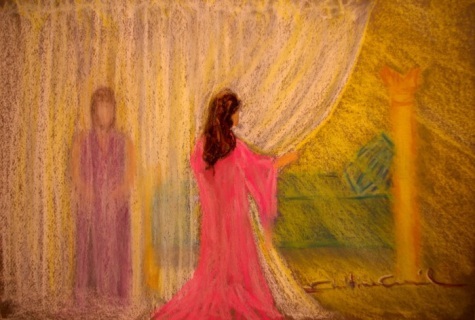 I think, the reason He gave me this painting is because, so many in the Body have been struggling financially, and I believe God just wants to encourage us that He is the King of Kings, He sees and knows...and loves us. I pray you will become like a child again, crawl up on His lap...and whisper in His ear...because He does care, and He REALLY wants to bless you! Merry Christmas! I saw this in a MOW meeting when I prophesied to a woman. I saw that God wanted to give her a book. Then I had this vision. He was waiting for her. It is in the secret place of intimacy with the Lord that He impregnates us with His purpose. He overshadows us like He did with Mary and we become one with Him. One in Spirit, purpose, desire, life... I painted this on New Year's Eve of 2010 because I believe we are stepping into a new season, the start of a new decade. And the Blue Moon we are having, it speaks of revelation from heaven, and the moon is the Bride because she reflects the Glory of the Son! 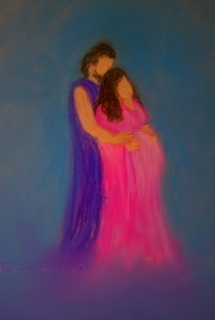 So I think it means that God is going to be giving revelation of heaven, and heavenly things for His Bride this year... Some will even go there for revelation...but it will require you to be intimate with Him. We can do NOTHING apart from Him!!!! One day I had an urge come to me to yell, "PUSH, the baby is ready to come!!!" I was driving and just wanted to yell it out my window. Then not long after that I prayed and saw the Bride pregnant. I waited until He told me it was time for me to paint it. Yesterday all of a sudden, it was time. I went into my studio and lifted my hands and then I was "there". I was pregnant, my hands were on the baby, and His hands were on mine. I was leaning on him and my head was tilted back laying on his shoulder. I feel that the reason I am seeing this is because it is time. We have been waiting, pregnant with His promises, and now, the time is near. The GREAT Harvest is beginning. Many of us have been in preparation and we are pregnant full term with ministries, and the time is near that His children will all be birthed! Yes LORD!!! I saw this vision at the same time I saw the Bride pregnant with His promises. But I had to wait until it was time. It is almost Valentine's Day, and God has been speaking to me about love and family. He showed me that children are homemade valentines, gifts of love, and as HIS children we are like that to Him. Our ministries are too...gifts of LOVE birthed out of intimacy with HIM because of love for Him & others. Someone sent me this scripture the night I painted this: Beloved, let us love one another: for love is of God; and every one that loveth is born of God, and knoweth God. He that loveth not knoweth not God; for God is love. In this was manifested the love of God toward us, because that God sent his only begotten Son into the world, that we might live through him. Herein is love, not that we loved God, but that he loved us, and sent his Son to be the propitiation for our sins. Beloved, if God so loved us, we ought also to love one another. No man hath seen God at any time. If we love one another, God dwelleth in us, and his love is perfected in usAnd we have known and believed the love that God hath to us. God is love; and he that dwelleth in love dwelleth in God, and God in him.Herein is our love made perfect, that we may have boldness in the day of judgment: because as he is, so are we in this world. There is no fear in love; but perfect love casteth out fear: because fear hath torment. He that feareth is not made perfect in love. We love him, because he first loved us. If a man say, I love God, and hateth his brother, he is a liar: for he that loveth not his brother whom he hath seen, how can he love God whom he hath not seen? And this commandment have we from him, That he who loveth God love his brother also. You see, we all need love, so He made us all FAMILY, so by Him and through Him we are a family of LOVE!